Get your traditional full English breakfast fix except this time with a Mexican fiesta twist. These delicious Breakfast burritos has all of your classic breakfast ingredients. Crispy bacon, scrambled eggs & meaty sausages. 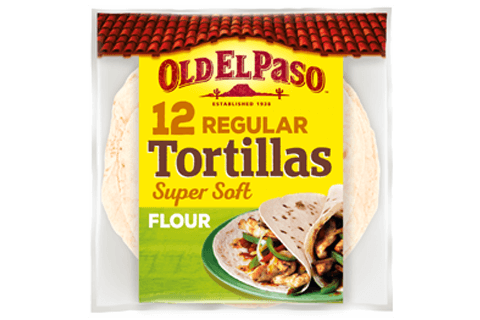 The fiesta inspired Mexican twist comes from the flavourful Old El Paso Roasted Tomato and Pepper Fajita Seasoning Mix & Soft Flour Tortillas. 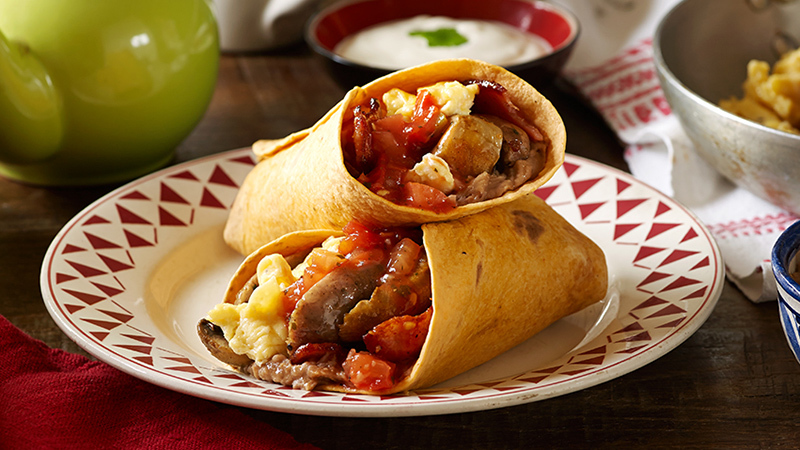 So begin your day with a Mexican samba and tuck in to a delicious breakfast burrito. Meanwhile, crack the eggs into the mixing bowl and whisk thoroughly before pouring into a saucepan and cooking on a low heat, until scrambled, stirring slowly throughout. In a second saucepan, gently heat the refried beans until hot. Using oven gloves remove the trays of bacon, sausage and mushroom from the oven. Finally, warm your tortillas in the microwave for 35-40 seconds. To assemble your Breakfast Burritos, spread the refried beans on the soft flour tortillas using a metal spoon, then top with a layer of bacon, sausage, scrambled egg sprinkled with fajita seasoning mix and a large spoonful of salsa. To wrap your burritos up - fold the bottom edges upwards, then the sides inwards to create a roll with one open end. Tip: Try warming the flour tortillas through by simply microwaving for 30 seconds before serving.